Fig. 9-1. Random Errors in Sun and Magnetometer Data From GEOS-3. 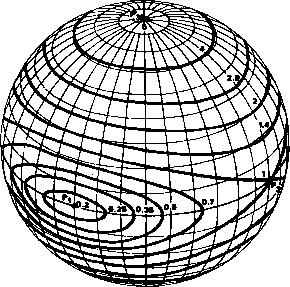 Columns 3 through 5 list the x,y, and z components of the measured magnetic field vector. The last three columns list the Sun sensor identification and the two Sun angles. Underlined values are spurious. correct than random errors, which occur at isolated points within the data. Examples of these types of error in data from the GEOS-3 spacecraft are presented in Figs. 9-1 and 9-12 (Section 9.3). These examples include random hit errors in Sun and magnetometer data (Fig. 9-1) and systematic errors in Sun data (Fig. 9-12). Figure 9-2 illustrates rotation angle data from the AE-3 spacecraft which contained so much random noise that automatic data validation was impossible. Operator intervention and iterative processing were necessary to identify valid data (at rotation angles of about 450 deg).